[Keller Williams] – RED Day, Keller Williams Realty’s annual day of service is alive and well at Keller Williams of Valencia. There’s no doubt that each member of the market center will give where they live; making a huge impact in our beautiful community. Valencia, May 10th: Keller Williams Associates will be hosting an ice cream social for the seniors at our Local Senior Center located in Downtown Newhall. Agents from the Keller Williams office will have been working tirelessly collecting canned foods for the seniors as well as other much needed items. Agents from KW will also be spending time with the seniors; including their lunch hour and a much anticipated dance party! 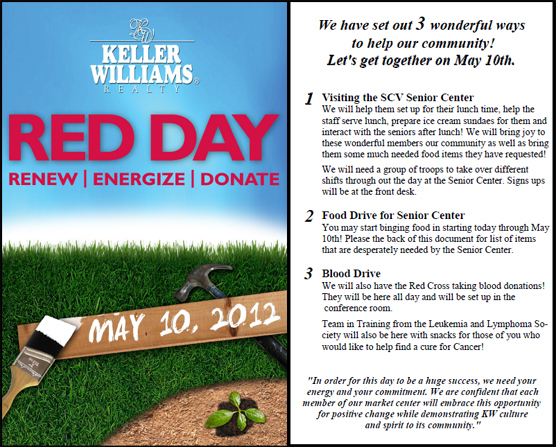 Keller Williams will also have a Red Cross blood donation center set up in their conference room for the day! If you wish to donate blood please feel free to visit the Keller Williams Valencia Office at 25124 Springfield Ct. Suite 100, Valencia CA 91355. At 1:00 pm the Leukemia and Lymphoma Society will stop by Keller Williams to show their agents how to help find a cure for blood cancers. All in all it will be a great day, full of impactful ways to change our community.